The Rev. 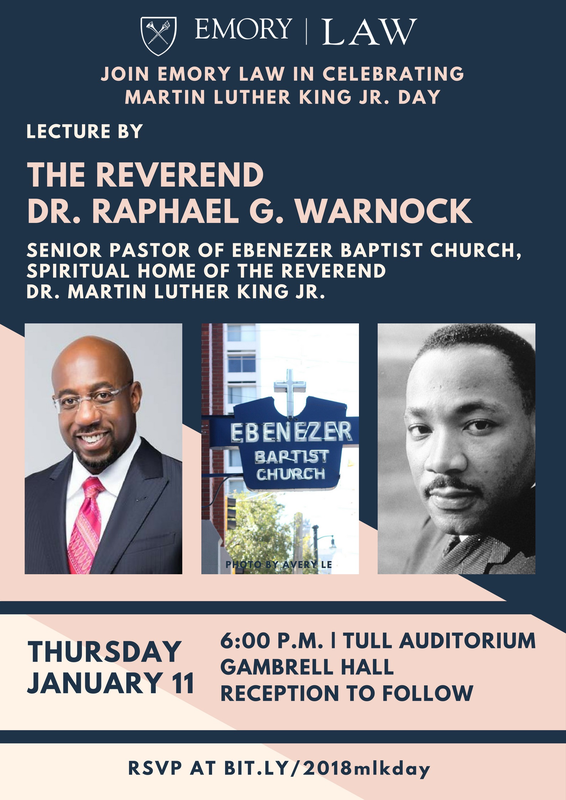 Raphael G. Warnock, senior pastor of Atlanta’s historic Ebenezer Baptist Church, will give a lecture in celebration of Martin Luther King Jr. Day at Emory University School of Law at 6 p.m. Thursday, Jan. 11, in the law school’s Tull Auditorium, Gambrell Hall, 1301 Clifton Rd., Atlanta. Since 2005, Warnock has served as the senior pastor of Ebenezer, the spiritual home of the Rev. Martin Luther King Jr. The son of two Pentecostal pastors, Warnock became the fifth and the youngest person ever called to the senior pastorate of Ebenezer, which was founded in 1886. Under Warnock’s leadership, more than 4,000 new members have joined the church, enhancing its legacy of social activism with both spiritual and numerical growth. Warnock graduated from Morehouse College with honors in 1991, receiving a Bachelor of Arts degree in psychology. He also holds a Master of Divinity degree from Union Theological Seminary in New York City, from which he graduated with honors and distinctions. Warnock continued his graduate studies at Union, receiving a Master of Philosophy degree and a Doctor of Philosophy degree in the field of systematic theology. Warnock is a member of Alpha Phi Alpha Fraternity Inc. and the 100 Black Men of Atlanta Inc., and is a lifetime member of the NAACP. His activism was honored in 2016 when his footprints were placed on the International Civil Rights Walk of Fame. Warnock’s lecture will be followed by a reception in Hunter Atrium. Free parking will be available after 4 p.m. in the Lowergate South Parking Deck, 1705 Lowergate Drive, Atlanta, GA 30322. 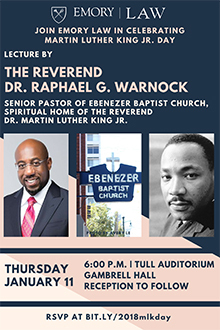 Admission is free, but attendees should RSVP at bit.ly/2018mlkday.